to make the first village. This site was born of a love of bamboo. Those of us that have experienced the solemn and relaxing sound of wind in bamboo leaves, will always hold a place in our lives for these magnificent and useful plants. We sincerely hope that these pages will not only supply the viewer with useful information, but will also forever embed the magnificence of bamboo in your heart and mind. As the beauty and potential of bamboo has been greatly overlooked in the west, we are eager to encourage the research and study of these incredible grasses. With the findings we collect here, we hope to promote understanding and to educate people about the uses and growth patterns of bamboo plants. This project is intended for both the bamboo novice and the expert. From the Species Source list you can search for bamboos based on size and hardiness then view pictures of the bamboo and find the Sources that have that bamboo. You can also search for photos of bamboo at the Bamboo picture page and enter pictures at the Picture Entry page. We also have the ability to collect data relating to the propagation and growth of bamboo and will soon have reports that will organize the growth data. This project is the collaborative effort of many members of the Bamboo community from the USA and around the world. For more information or if you have questions, please e-mail our Webmaster or comment in the Bamboo Forum. 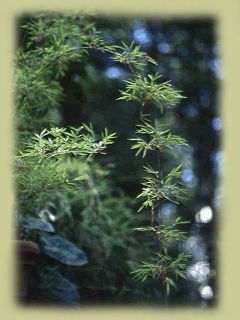 We thank the American Bamboo Society for supporting the site by allowing the use of the ABS species/source lists. For Membership information check the ABS membership form or join on the web Here. You can also find other bamboo societies on the Bamboo Links page. The VIP code for the forum is "bamboo".